goDog® in Colorado have come to represent innovation, FUN, optimism and durability! They are well-known for durable plush toys and they are, now expanding into fun, innovative retrieval toys. A unique and thoughtfully designed range of toys for indoor and outdoor interactive play! 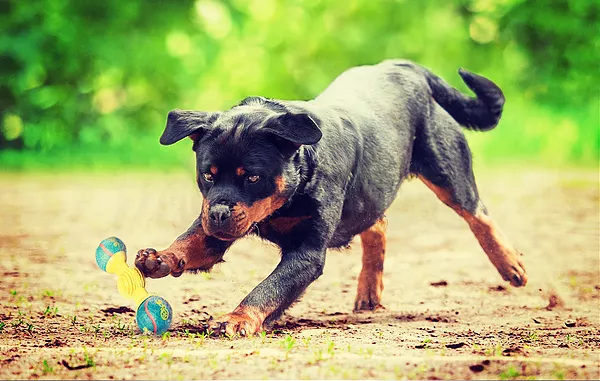 goDog stands for fun and this is what these toys are about for you and your dog. 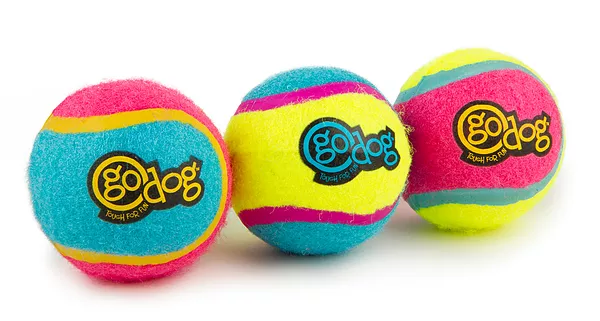 goDog® Retrieval Ultimate Ballz™ are revolutionary tennis balls with ToughCore Technology™ but won't bounce on a tennis court, but your dog will love them. All Dogs love to chase balls, especially tennis balls, but regular tennis balls can pop when dogs chew them. Tennis balls that have popped can present a serious choking hazard. The foam insert in ToughCore™ balls helps prevent the ball from popping and therefore makes for a safer tennis ball for dogs. This is a major advance in tennis ball toy safety! By increasing the strength of tennis ball seams we’re decreasing the likelihood of common tennis ball splitting and therefore helping to prevent dogs from choking on broken balls. It's also an advancement in "FUN" for dogs too, lets see happy optimistic dogs playing with Ultimate Ballz. 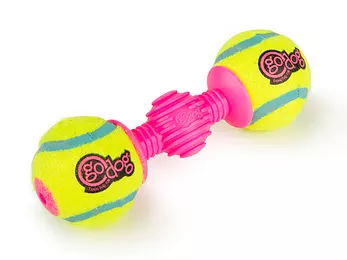 goDog® Retrieval screwBallz™ are revolutionary tennis balls with ToughCore Technology™. These unique tennis balls have bumps and ridges so they bounce erratically. This is a major advance in tennis ball toy safety and dog play fun. If you want your dog to have the ultimate experience and be an awsome optimisitc dog they need screwballz! By increasing the strength of tennis ball seams we’re decreasing the likelihood of common tennis ball splitting and therefore helping to prevent dogs from choking on broken balls. The goDog® Retrieval goBounce™ is the best of both worlds! A bone and balls. Two tennis balls with ToughCore™ Technology are attached to a strong plastic bone centre. This will be perfect for your happy, optimistic dogs. This toy has a fun all over it and we all want our dogs to have fun and to play games. The erratic bouncing pattern will just increase that element of fun that your dog will love! Made in bright colours that your dog can see! The balls on the goBounce feature ToughCore™ Technology - A durable foam insert with bonded seams for a stronger tennis ball and yes, even more fun. The goDog® Retrieval gloBounce™ is the best of both worlds! A bone and balls for fun play! 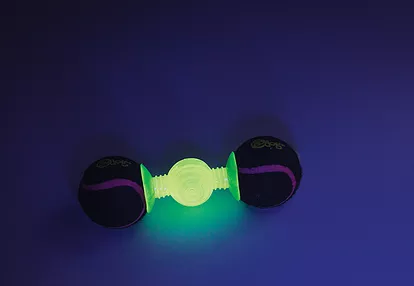 Perfect for night-time dog walks - This unique item comes in fun glow-in-the-dark plastic for night time enjoyment! 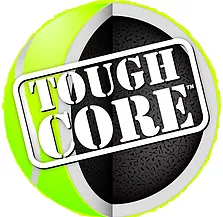 Two tennis balls with ToughCore™ Technology are attached to a strong plastic bone center. Fun, fun fun all the way! 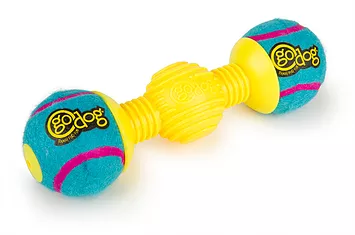 This toy has a fun and erratic bouncing pattern that your dog will love! What more do you need for a fun, optimistic dog? The goDog® Retrieval Winger™ features a durable handle with a removable/replaceable goDog tennis ball. This awesome design is perfect for playing fetch with a bit of zing! Your dog with love the fun. The stretchy material can be launched like a slingshot or thrown with the handle. The tennis ball stays safely lodged in the toy. 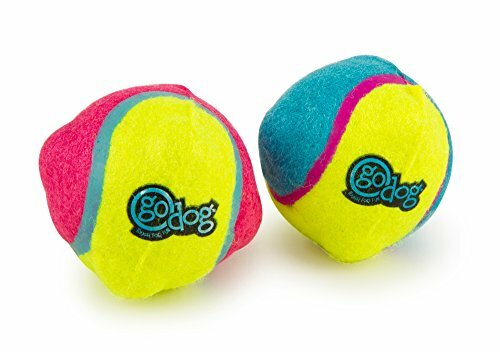 The goDog® Retrieval goFetch™ picks up any sized tennis balls, goDog Ultimate Ballz and goDog ScrewBallz – NO MORE SLOBBER! Most of these such toys are restriced to a standard tennis ball. Use without a tennis ball and and put food in to play a different exciting dog training game. 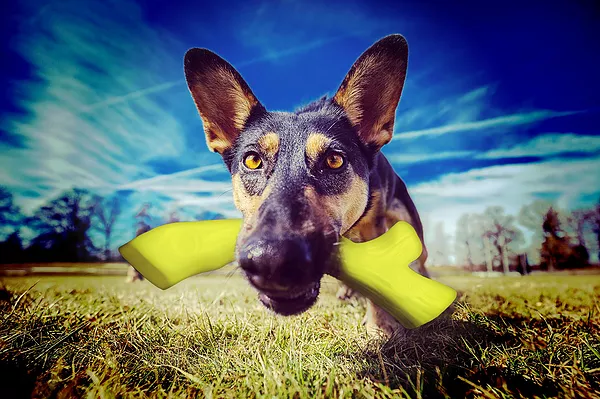 The goFetch was designed with a unique duro-flex hinged jaw that works on any sized, toy in almost any material! 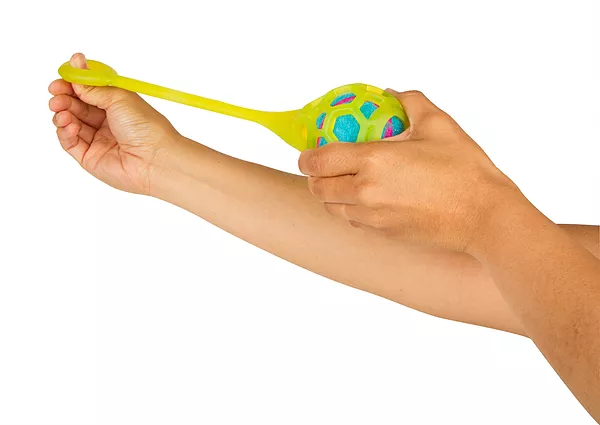 This design allows for you to have just one thrower for all of your tennis balls. Perfect for a day out on the beach, in the park or in the garden. The goDog® Retrieval Ultimate Disk™ is a durable disk for dogs that play tough! This toy is about fun and lots of it. 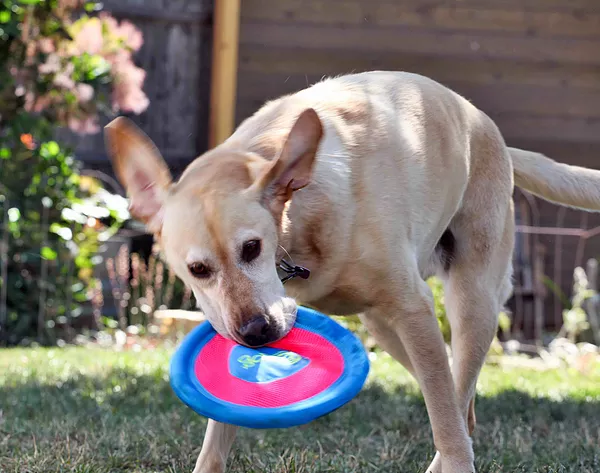 The Ultimate Disk is made with Chew Guard technology™ to prevent rips and tears and give dogs a textured and durable surface for easy pick up. Bright blue and yellow colors are easy for dogs to see. The Ultimate Disk is made with durable eco-friendly, phthalate-free tubing around the edge so it is soft on your dog's teeth and gums. The Ultimate Disk is made is a domed shape for lofty flight. 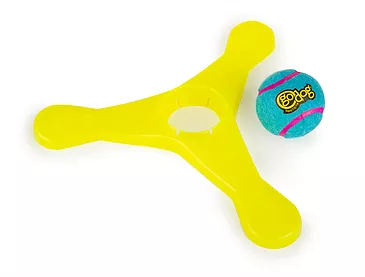 Flip the disk over to use as a water bowl at the dog park! Wow!! 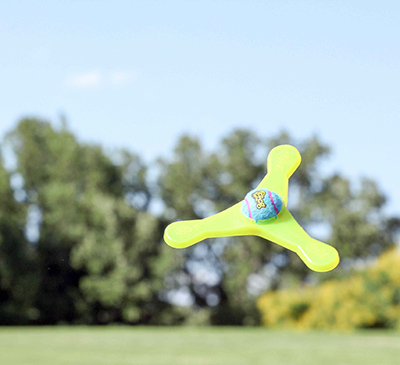 The goDog® Retrieval triFlyer™ is a fun tennis ball toy with a frame for long-distance flight! Made out of flexible plastic, this toy is easy on your dog's sensitive teeth and gums. The ball and plastic frame are made in bright colours that are easy for you and your dog to see. Be aware this toy contains a battery and so, not designed to be a chew toy, please use supervised.